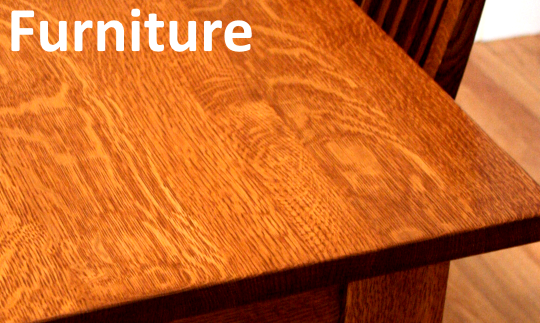 Furniture is an important industry for the Amish. Here are some common questions about woodworking in the culture. Furniture built by the Amish possesses a number of characteristics attractive to buyers. For one, it is generally considered to be of high quality, and usually reasonably priced, though purchasing via a third-party retailer rather than direct from an Amish manufacturer will add a layer of cost. Another important quality is the identity of the manufacturer. At risk of stating the obvious, furniture buyers appreciate the fact that Amish people make the furniture. It provides a backdrop to go along with the product itself. In contrast to a piece of furniture either mass-produced or created by an unknown craftsman, each Amish-made piece of furniture comes with an additional “story” that can be shared with visitors and friends. For more on the topic, Amish woodworker Dennis addresses some myths and realities of Amish furniture. Amish-made furniture for sale at a Pennsylvania Dutch market. York County, PA.
Amish build furniture in many different styles. Mission and Shaker are two of the most popular. Amish craftsmen also create furniture in a range of styles and motifs, including modern, contemporary, arts and crafts, Queen Anne, and more. 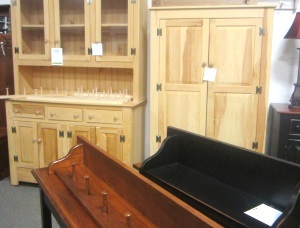 While some create and sell standard furniture lines, many Amish offer custom-made furniture built to individual specifications. The answer depends on the meaning of “hand-made”. If it means exclusively crafted with hammers, chisels and primitive implements, no. If it means that the makers use their hands to manipulate wood in conjunction with various pieces of equipment and tools, yes. Amish do use various implements to cut, sand, smooth and carve wood, including saws, sanders and lathes. How are Amish furniture shop tools powered? This depends on the Amish group in question. Some Amish use only very limited technology. In these cases, shop tools such as saws and planers will be powered by a line shaft system. A diesel generator drives a line which is located beneath the floor of the furniture shop. A series of belts rise from the line shaft in the floor and connect to machinery to provide power to various implements in the shop (see an example here). In more progressive groups, “Amish electricity”, as scholar Donald Kraybill has termed it, is used. This consists of tools adapted to function on either hydraulic and pneumatic power. Read more about the technology in an Amish furniture shop. Who sells Amish furniture? Do Amish sell directly to the public? Some Amish businesses sell their furniture directly to the public, but it’s more common that they collaborate with a non-Amish retailer. This can make marketing easier and online sales possible. Many non-Amish people own businesses selling Amish-built furniture. Amish who do sell their own products directly to the public may have a retail store on the property. Find an Amish furniture store in your area. Wesner, Erik. Success Made Simple: An Inside Look At Why Amish Businesses Thrive. San Francisco, CA: Jossey-Bass, 2010. To Cite this Page: Wesner, Erik J. “Furniture.” Amish America. Erik Wesner, 11 Feb. 2015. Web. [Date Accessed]. <http://amishamerica.com/furniture/>.